Joy to the World Christmas party takes kids on a trip around the world to see how other countries celebrate Christmas. 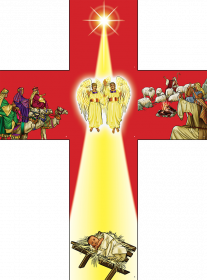 The unique visuals (extra large "Christmas cards") will teach children how Isaiah's prophecies about the Messiah came true through Jesus. This party reinforces the truth that Jesus was prophesied hundreds of years before His birth and that the Bible can be trusted. English text--includes everything for a fun Christmas Party: craft, game, snack ideas, Gospel plane with instructions and more. Resource PowerPoint CD--provides PowerPoint visuals for the lesson, memory verse, and songs. 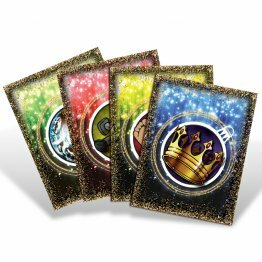 Reproducibles for invitations, nametags, tokens and game pieces in color or black & white. And a new 'how to video" - how to use these new visuals. 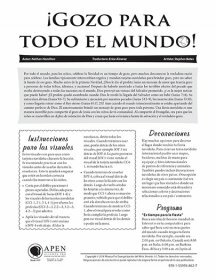 Spanish text for Life of Life Christmas party lesson. In the Light of the World children will learn how God created and used light in some amazing ways to announce the birth of the Savior! Visuals available only with English kit. In the Light of the Life children will learn how God created and used light in amazing ways to announce the birth of the Savior! Kit includes 17" x 22" fold-up visual, English text, Gospel plane with instructions and resource PowerPoint CD. English text includes everything fun to have a Christmas party: craft, game, snack ideas and more. -Reproducibles for invitations, nametags, Christmas card craft, poster, tokens. 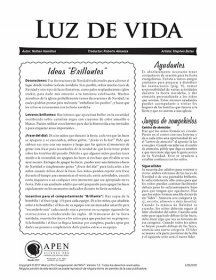 -PDF files for name tags, promotional posters, invitations, memory verse take-home sheets (tokens), Christmas card craft and promotional items in Spanish. Many of these in full-color and black & white. Partner with CEF for a Christmas Across America Party! Instead of your giving a present at this birthday party, Jesus, for His birthday is giving you the gift of salvation. 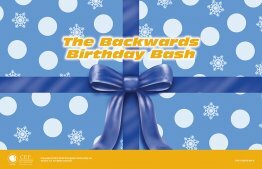 Staff, volunteers and children will have fun with the "backwards" theme. The lesson is the true Christmas story where the visuals are displayed behind gift wrapping. As the "present" is unwrapped, different aspects of the Christmas story are revealed. 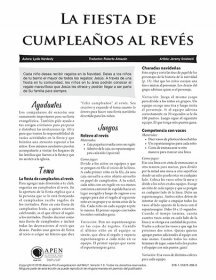 Spanish teacher text to teach the Christmas lesson Backwards Birthday Bash. 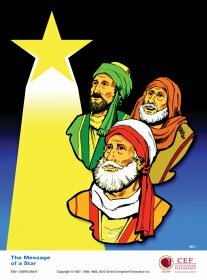 Take children on an incredible journey as you share the story of the wise men who followed the star to Jesus. Kids learn that God reveals Himself to those who seek Him. Party Helps include: decoration & snack ideas, suggested songs, review games, reproducible invitations & take-home token, memory verse visual. 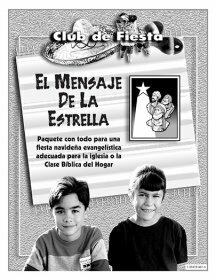 Spanish teacher text for the Christmas lesson The Message of a Star.